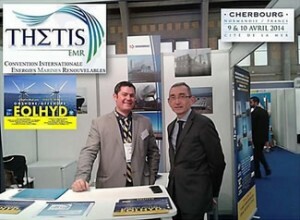 SOGEBRAS, through its subsidiary ATLANTIQUE MANUTENTION, was present at the EOLHYD stand during the Thetis exhibition in Cherbourg, from the 9th to the 11th of April 2014, to meet its customers and prospects within the context of Renewable Maritime Energies. EOLHYD is a network of independent partners based mainly on French maritime coastlines, who can provide, directly or through their subsidiaries, a set of onshore and offshore services. ATLANTIQUE MANUTENTION, in Saint-Nazaire and Montoir de Bretagne.